Don's Welding Service is a locally owned and operated business. 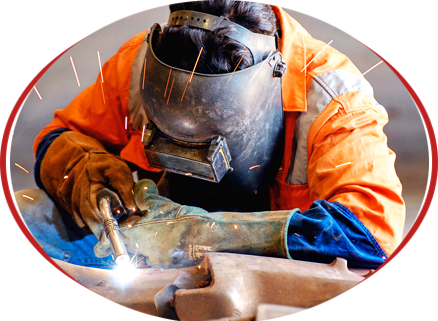 Our experienced employees can weld virtually anything. We strive for perfection when it comes to the level of quality we put into our work. A few of our clients that we have done and still continue to do work for include: Lamcam, Sunstrand Aviation, Automated Solutions of America, United Toolers of Illinois, Metals and Services, Aqua Aerobics Systems, Martin Automation, and Arachnid. So if you have something that you need welded, cut, rolled, or any of the other services listed below request a quote today! We are here waiting and would love to help you out! I was very impressed by the creative solutions provided by Don’s Welding. He listened to my needs and provided an excellent product. The bathroom is finished and looks great! The sink has caught everyone’s attention with lots of praise! I did write to the Better Business Bureau (I wasn’t kidding!). Thanks so much!